This recipe makes for a great weeknight meal because the entire thing is ready in no time, and the meatballs can be made ahead of time if you wish. You’ll feel like you’re eating in an Italian restaurant eating authentic Italian food. Yummmm. Preheat oven to 375 degrees. Fit a baking sheet with a wire rack and coat with cooking spray. Set aside. In a large mixing bowl, mix beef, pork, eggs, breadcrumbs, Parmesan, Italian seasoning, mustard and spices until well combined. Form equal-sized meatballs, about 2 inches each in diameter, and place on the wire rack. Bake for 10-12 minutes, until browned. In a cast iron or oven-safe skillet, heat olive oil to medium-high heat. Add spinach and cook until wilted, about 2-3 minutes. Stir in garlic and season with salt and pepper. 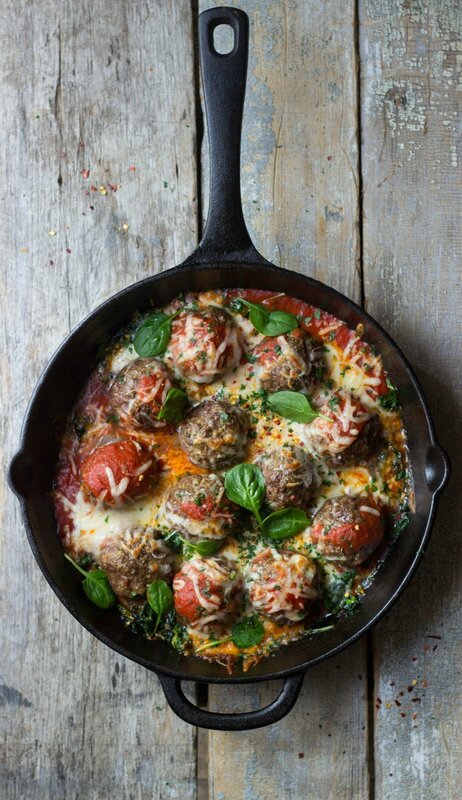 Place cooked meatballs in the skillet and cover with marinara, then top with slices of mozzarella. Place skillet in the oven and cook 6-8 minutes, until marinara is hot and cheese is melted. Turn oven to a low broil and broil 2-3 minutes, until cheese is bubbly and browned.